How to Use a Tig Welder for Advanced Metalworking Projects? How to Use a Scroll Saw for Some Intricate Woodworking Tasks? Have you ever wondered how those beautiful patterns are made on wood pieces? Do you ever think of them to be some magic or something? Yes, they can be whatever you think them to be except that they are effected with a scroll saw. Scrolls saws are a woodworking tool that makes it easy for the users to effect pattern on wood pieces in the most accurate way. In order to make use of it, we have decided to provide you with this discussion on how to use a scroll saw. This is a comprehensive guide and you have to not just read through to the end, but understand it. If need be, you can read it over and over again. The table which provides a balanced framework for work pieces to lay on while the design is carried out. The blade which is the part of the scroll saw for making cuts. The power on/off switch which helps to control the power of the scroll saw. Wires and cables that sends power from the power supply cable into the scroll saw. How to Use a Scroll Saw? Some beautiful design patterns you may have seen on your neighbor’s furniture. The workers must have gone through some rigorous process that required a lot of attention and particular scroll saw techniques. In order to aid your knowledge of how to use scroll saw patterns, we shall be going through the step by step procedure of using a scroll saw. You would not want to be going around to get this and that when scroll saw cutting. This is why it is very necessary for you to have all the required tools gathered first before you start working. Among other things that will be needed include the scroll saw itself, the wood piece upon which the pattern will be made, the scroll saw monogram patterns, and the safety items to be worn. You will also need a scrap wood piece to give the project the balance it needs for an accurate result. When all the tools that will be needed have been prepared, you will have to set up the saw. Take out the saw from the container especially when you have disassembled it from storage. Carefully take out the blade as well and fastened it back to the saw and secure it well. Do this carefully so as to avoid your hands and fingers from coming in contact with the saw. Once you are done setting up the saw, before preparing it, it is best to prepare the work piece. Have the pattern you want to replicate and get the wood piece ready on the table. Fasten it with the table and have it secured with the table clamps so as not to fall off or shift when you start using a scroll saw. Since these machines yield to a diverse range of uses, certain safety measures should be maintained while using it. Put on safety equipment like face masks, eye goggles, and protective hand gloves. All these should be worn before putting on the scroll saw. If you have really long hair, you will have to tie it or wear a cap before you commence operation with the scroll saw. For those allergic to dust, you can put on a dust mask to help shield you from it. Take off from your body any accessory that can get caught up in the blade while sawing with a scroll saw. In preparing the saw, you have to pay attention to several parts of the blade one of which is the tension of the blade. You have to set the tension of the blade after it has been fitted. This should be done based on the manufacturer’s instructions as provided for the scroll saw how to use manual. When your scroll saw is prepared, go on to switch on the saw to have the blade tested before you commence work with the scroll saw. This is very helpful because, at this stage, you not only detect any defect with the blade but other parts of the machine. It is better to notice a defect with the scroll saw before using the machine that while it is in use. After testing the blade, if an adjustment needs to be made to the blade height or tension, make sure to correct it immediately. Whatever you want your scroll saw to do, you need to adjust the speed of the scroll saw is very necessary as the speed needed for each work piece differs. When working on a hardwood piece, you might need to lessen the speed if you want to achieve accurate results. On the other hand, increased speed is needed when working with softwood. The softer the wood, the higher the scroll saw speed needed to make it function effectively. With the saw prepared and all adjustments needed to be done to the table, blade and speed made, you can start cutting. While cutting, make sure to keep your hands away from the blade and have the design well secured on the work piece. You have to keep the design secured on the work piece if you want to achieve a regular pattern. To do this, you have to bring the design piece up to the blade’s height as you go towards the first line to be cut. Keep the wood press down as so adjust it to make small turns with your thumb. Make sure you do this with care and attention so that your hands and the blade don’t come in contact. You might be thinking that a 90-degree turn is possible with only the best scroll saw. It might be true but not entirely. You can do it yourself by following some simple tips. 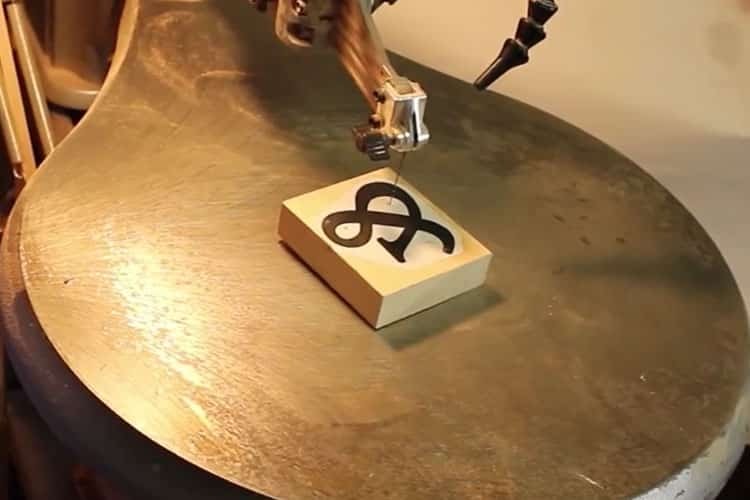 All you need to do is understand how the scroll saw works. To do this, you will have to pay attention to the turning point of the blade. Upon reaching 90°, you will have to draw the wood back and allow the blade the opportunity to move towards the line that has been drawn. Then gradually turn the wood around till it faces the adjacent line. Go on to make your cut as you guide the piece through the blade. After making your 90° exactly the same way a pro would, you have to finish your pattern. In finishing your pattern, you have to look through the entire wood piece to be sure what you have is exactly what is desired. If any corrections need to be made to the pattern, you can make them at this point. As soon as you are done using a scroll saw, first turn it off. When you are sure it is off, take off the blade from the saw and keep it in the storage container that comes with. Also, the scroll saw know itself can be detached from the workbench and stored separately if it would not be used anytime soon again. Remember a scroll isn’t like most other saws. So, you need to follow some dos and don’ts that are applicable to everyone regardless of your level of professionalism in woodworking. These precautions and provisions have been put in place for you in order to facilitate easy use of the scroll saw. Try to keep the scroll saw machine in its peak condition before using it. Put your safety glasses and protective masks on while using the machine. Understand how to scroll saw thoroughly with every step covered. Adjust the scroll saw speed depending on the project demands. Remove a pattern once it’s completed; so you can get more room on the table. Do not allow your hand to come in contact with the saw while sawing. Keep your hands afar off from the scroll saw. Do not allow children to have access to the saw before, during and after use. Do not forget to put off the scroll saw after every use. Do not put off the scroll saw abruptly while still in use. Do not forget to have the work piece well secured so as to keep the pattern regular while working. This whole procedure of knowing how to use a scroll saw will not be complete if you do not maintain the saw. Maintenance of the scroll saw is as important as using it. You have to ensure timely maintenance of the scroll saw if you want to keep it in the best working condition. So how do you maintain and tune up the scroll saw? Make sure to constantly clean the scroll saw before and after every use. Take dirt lurking in areas of the saw away and wipe the saw with a clean cloth. Check the wires and power supply cables if the scroll saw regularly for any wear, tear or breakages before and after every use. See to constantly lubricating the parts of the scroll saw so as to allow for these parts to function one against the other effectively. With this discussion, you no doubt know how to use a scroll saw. However, the simple trick remains that regardless of what you know about a scroll saw, you have to exercise utmost care when making use of one. Pay attention to every detail, especially the safety regulations as one careless step can ruin the entire project. Scroll saw cutting can be really nice if you know how to use a scroll saw safely. Always refer to the scroll saw how to use manual for more helpful information on using a scroll saw. 1 How to Measure Chaps to Suit Your Clothing for a Perfect Fit? 3 What Is a Hammer Drill?